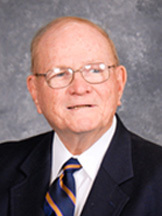 A new scholarship has been established by Sigma Pi Fraternity to honor a great Sigma Pi brother, Honorary Grand Sage James L. Hills from funds contributed by family and friends. The memorial scholarship honoring the life of Jim, who died on February 3, 2014, has been created at the Vincennes University Foundation. It will provide funds for a Sigma Pi Fraternity member currently studying at VU. As Executive Secretary, in 1963, he supervised the move of the Sigma Pi Executive Office from Elizabeth, New Jersey to Vincennes, Indiana. In 1965, Hills also played a role in re-establishing the Fraternity’s mother chapter, Alpha, at Vincennes University after a 55 year hiatus. In the late 1980’s, he was part of a group that was instrumental in the construction of the current chapter house of the Alpha Chapter, as well as raising the funds and building the Sigma Pi Clock Tower on the VU campus, which commemorates the centennial of the Fraternity’s founding. The street behind the chapter house is named in Hills’ honor. The scholarship recipient will be a member of the Sigma Pi Fraternity and a current Vincennes University student. The scholarship will be awarded annually to either a traditional or non-traditional, part-time or full-time student at the Vincennes campus majoring in any field. To donate to the James L. Hills Memorial Scholarship, please click below and select the James L. Hills Memorial Scholarship option. Please visit the James L. Hills Memorial Scholarship Facebook page for news, updates, and stories showing how you are helping to change the life of a deserving student. We couldn’t do it without you! Watch the tribute video of James L. Hills that was played during the 2014 Alpha Founders' Banquet here. Apply for the James L. Hills Memorial Scholarship here.